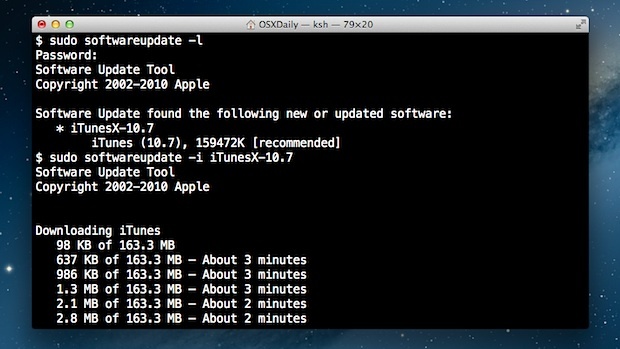 Using the command line softwareupdate tool you can update Mac OS X system software without using the App Store. This is particularly useful for Mac users running OS X 10.8 or later where the software update system is primarily handled through the Mac App Store, but can occasionally either go awry or be inaccessible in situations of remote administration. Get started by launching Terminal, found in /Applications/Utilities/. To list the available software updates, use the following command. The softwareupdate command only handles key system software components and updates and will not update third party applications. Applications downloaded from the App Store will need to be updated through the App Store and can not be updated through the terminal. Advanced Mac users know the softwareupdate command has been around for some time, but the new App Store based software updating system has made it more useful than ever before. Yes, I think that we can do anything from the Terminal. But most of the time it is simpler to use other instruments offered by Mac Os X. Really, thanks for those kind of advices. @Alberto I. Yes we can do it with other instruments built-in into OS X, but with the command-line options, you can really add flexibility to your environment, in exemple : adding the command into a cron daemon and it renders the whole process completely invisible, be done remotely and doesn’t load your computer with the App Store UI weight. Thanks for the tip. Software update since Mountain Lion has gone completely mad. More often than never I get the ‘can’t connect to the server’ notification. Just one little question. I love automation. Is there any way of making the tip working as a workflow in automator? I have always had problems downloading Apples new OSes from the App Store. Apple Updates are always fine (including the huge ones), but downloads of the OS from the App Store are always incredibly unreliable and slow. Invariably they fail several times, at varying degrees of download and I have to retry over several days, even weeks, before I am lucky enough for it to get through. Each time the download fails and I try to “resume” the download, it simply starts from scratch, instead of restarting from where failed! This has been the same for all of the OS releases done through the App Store. I never download a major OS release until at least .1 or .2 updates have been released, so I’m not competing in the new release “Gold rush”. I am on a 20MBps cable service, which is extremely reliable and fast (Downloaded Windows 8 ISO only last week in about six hours with no problem at all). While I was having these repeated failures and racing through my download allowance with repeated multiple GB download failures, I called Apple and explained my predicament. I asked if I could simply pay for the OS media. The Apple rep said that they do not manufacture such a thing and I would only ever be able to get the OS from the App Store. So, I have paid for the software and due to Apple’s inability to effectively manage the QoS on their delivery infrastructure, I am unable to get to the goods that I have purchased! Are consumer protection bodies across the world aware of this situation? Also, whilst understandable from Apple’s distribution and manufacturing costs perspective, this ineffective delivery mechanism also totally disregards a fairly significant proportion of the people out there who have slow or unreliable Internet connections or low download allowances. I finally got it to doanload today, almost a week after I purchased it in the App Store. I am expecting my Internet connection to be shaped any day now, for the rest of the month. Next OS Apple releases, I’ll try your command line method, but if the problem is Apple’s update systems in Akamai, then I’m not expecting any improvement to this repeatedly painful process.